He had trouble finding shoes for his size 14 feet, apparently. 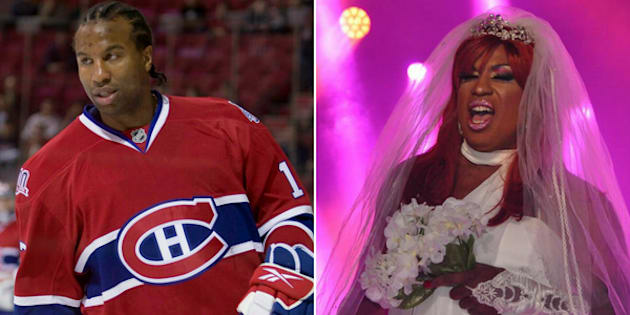 Georges Laraque, best known for being a former NHL enforcer, won a drag queen competition at Montreal Pride on Friday. A lot of news happened in 2018. We're looking back at some of the biggest stories from the last 12 months. Also, we hope you have a great year ahead. Happy 2019. Georges Laraque is a former NHL enforcer, a mixed martial arts competitor, a vegan restaurateur, a radio host, a former Green Party candidate, and once played the André the Giant role in a TIFF live-reading of "The Princess Bride." He can now add another title to that list: champion drag queen. Laraque, who is a musclebound presence at 6 ft. 3 in. and 300 pounds, wore a wedding dress to compete in a Montreal Pride charity lip-synch competition on Friday. The ex-Habs player performed to Whitney Houston's "I Will Always Love You," Star Edmonton reports. Laraque was one of several surprise celebrity guests at the event, which involved both professional drag queens and non-drag queen celebrities coached by real performers. The lineup included queens like Michel Dorion, Pétula Claque and Tracy Trash. The other celebrity guests were francophone Youtuber PL Cloutier and TV host Geneviève Borne. Laraque made his entrance in a strapless floor-length wedding dress, long red wig, flowing veil and slippers. He finished his look with strapless gloves and a bouquet, of course. On Twitter, he thanked Montreal drag queen Miss Butterfly, also known as Johnny Naoufal, who did his makeup for the competition. Laraque doesn't identify as part of the LGBTQ community, but was happy to take part in the drag competition when a festival rep asked him, he said. He hasn't experienced homophobia, but growing up in Montreal's Haitian community, he has first-hand experience with intolerance. "My parents came from Haiti. I don't see any difference from racial discrimination, and discrimination toward sexual orientation. It's the same fight," he told the Star. "So for me, calling me the 'N' word, and not accepting someone as homosexual is the same thing." Many fans expressed their enthusiasm on Twitter for Laraque's decision to don a dress. The winner was granted $1,000 to the charity of their choice. Laraque decided to donate the money back to Pride. Recent research by University of Alberta professor Dr. Cheryl MacDonald on attitudes towards homosexuality in the world of hockey shows that people are gradually becoming more accepting, Global News has reported. But as in many other communities, homophobia is still a problem. And as Dr. MacDonald has pointed out, there has never been an openly gay player in the NHL. It might be a good thing Laraque wasn't actually singing: in an entirely relatable sentiment, last month he told the Montreal Gazette that he loves karaoke, even though he's terrible at it. "I sing everything from Céline Dion to Mariah Carey," he told the paper. "My voice is so deep that I'm terrible. I sound really bad."